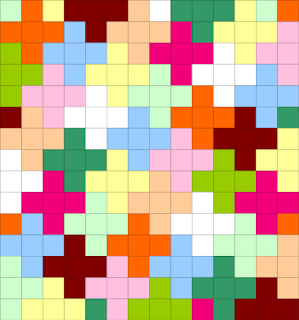 So, the final choice of pattern...a Plus Quilt. After picking out the pattern, I used a free quilt program and colored in the blocks to correspond with the material I'm using. However, I did have to find a few extra materials to finish having enough blocks. Also, I decide to go with all the same size blocks rather than making the longer middle sections of the plus sign. So, I do have all 210 6.5"x6.5" squares cut out and ready to sew together, however, I'm going to be working on another quilt for a little while, so this one will be on hold again... just not as far back in the pile as it had been! These blocks will be sent to Michigan to Margaret's Hope Chest to be sewn into quilts for kids. 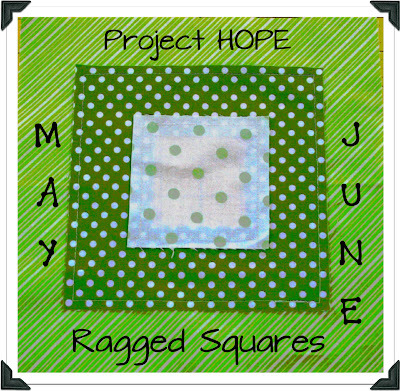 You can read all about it and see the tutorial on making these squares all at the Margaret's Hope Chest Blog. A bonus, the deadline was extended to the end of July, so there is still plenty of time to join in! I'm excited to try out some monochromatic sewing... I think this will be fun! You have a lot of great projects going on! That "plus" quilt is another great way to use up scraps; thanks for sharing! I love both the quilts. I'll have to make one of the plus quilts. The Plus Quilt will look awesome - they always do! Love seeing your WIPs! I do like the plus sign design. Simple but very pretty. Looks like a great one for left over fabric!